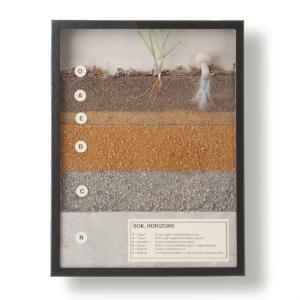 Soil formation presented in a classroom exhibit. This 16" X 12" classroom exhibit brings the ground beneath us into the classroom. From the organic layer of humus that creates fertile topsoil, all the way down to the bedrock, each layer of soil is clearly presented and defined (organic, topsoil, eluviation, subsoil, regolith, bedrock). This display is topped off with a stem of grass showing the roots feeding into the upper layers as well as a mushroom with it’s mycelium extending into the topsoil.